One reason I like the amusing and well-written blog called Poemas del río Wang, by the Hungarian publisher Tamás Sajó, is its photographs and illustrations, including the one shown above. Another reason is that it makes me glad to be alive in 2010-ish. If that sounds like auxesis, I should add that before 1990 the cultures of eastern Europe were much more difficult for an Englishman like me to negotiate. Back then, it was hard to see what was historically significant or culturally distinctive. That there were many connections to more distant cultures further east and south (as well as to my own) wasn’t obvious, either. During the post-war communist years, everything that was cultually interesting about the Eastern “Bloc” countries was obscured; we saw an eastern Europe composed of nearly identical states. Nowadays we know more. From the author’s home, near Budapest, he steers his way through many cultures: Armenian, Venice, Russia, different parts of the Ottoman Empire, Egypt. There are fields full of Persian lilies; melodies that have been played all around Europe in different languages (there are lots of videos of music and translations of song lyrics). Scrolling down the long page you will pass extraordinary photos of Russian and German soldiers enjoying each other’s company in Poland in 1939, just before the war, and pictures from a book of the architecture of pre-war Bucharest. There are also some lovely articles at río Wang showing pictures of Argentina: from giant cactuses to life in Buenos Aires, they are written by Julia, who sometimes comments on this blog. Also next door is A Garden Diary, the story of their amazing garden outside Budapest, written by Tomás’s wife, Kata, a psychologist, who created it. One day I’ll write about that blog. Tamás’s latest post has marvelous pictures of brněnský drak — the dragon of Brno, in Bohemia — who started life as a crocodile, in the early fifteen hundreds. 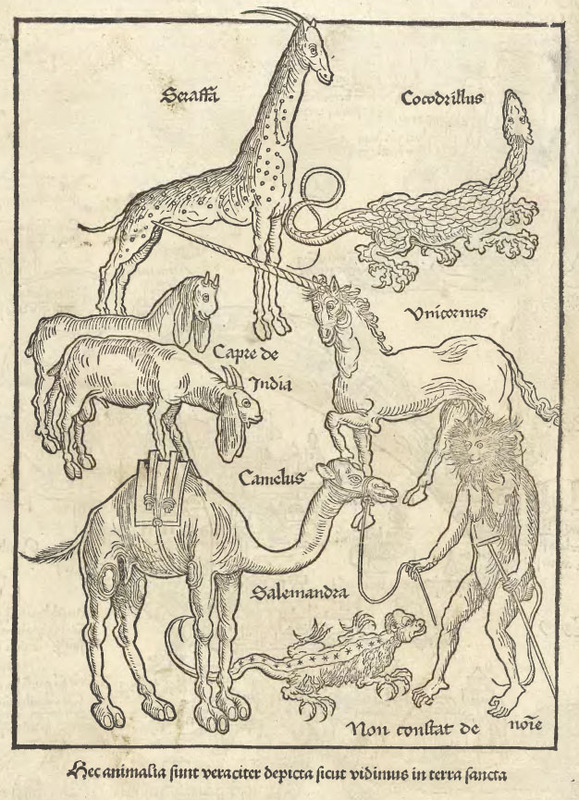 The article links to dragons, to Spain and Majorca, to the medieval import of exotic animals to Europe and best of all to the 700 year-old European tradition of hanging crocodiles from the ceiling. Previously all I knew about Brno was that it was the location of Mies’s Tugendhat House. Thanks to Tamás’s scholarship, his love of travel and his fluency in so many languages we all have an opportunity to find out so much more. It’s not just information, though. Whenever I read something at Poemas del río Wang I dream about it for days afterward. Update: If you’re wondering what crocodiles and Majorca have to do with goats, dearieme has supplied the answer here. In the novel Effi Briest, the country house to which she moves with her new husband has a stuffed crocodile hanging in the entrance hall. Estoy segura de que Tamás quedará encantado al leer tus palabras. Como no soy una parte tan sustancial de Poemas del Río Wang puedo asegurar que este elogio es muy merecido; he sentido exactamente lo mismo como lectora durante varios años. Falta solamente descubrir a la otra cabeza que forma Studiolum, el importante componente hispánico con quien ahora mismo se encuentra Tamás en Palma de Mallorca. It has a very long history, as Tamás has described, and I now see they’re all over the place. How did I miss it for fifty-something years? I’m going to hang (a plastic) one above my (blogging) window. You’re welcome, Julia, and thank you too. I hope your “translation button” works well! Actually, for Spanish & English I’ve found one that gives several alternative translations for you to choose from. I’m going to hang (a plastic) one above my (blogging) window. How about hanging one from the ceiling of your blog? Above the goats, in the blog header, so that they appear to be looking at it. Yes, that’s a good idea. Thanks. I have a feeling there’s a maximum size for that header space. I’ll take a look. Yes, that’s a good idea. Thanks. Plus, it would suggest another meaning of ‘a bad guide’. Das Krokodil, das Krokodil, das ist sehr faul und tut nicht viel. The crocodile, the crocodile, is lazy and too tired to smile. The elephant, the elephant, is large and grey and long in front. The lion there, the lion there, has a long tail and yellow hair. The big brown bear, the big brown bear, sleeps in the woods without a care. The little monkey, the little monkey, turns cartwheels and is very funny. The cockatoo, the cockatoo, rocks on his perch and screeches too. The flamingo, the flamingo, stands on one leg and then sleeps so. The ostrich, the ostrich, runs very fast without a hitch. Der Elefant, der Elefant, der ist uns allen wohl bekannt. Der Löwe da, der Löwe da, das ist ein Tier aus Afrika. Der dicke Bär, der dicke Bär, der rennt im Käfig hin und her. Der Affe hier, der Affe hier, der Affe ist ein lustig’ Tier. Der Papagei, der Papagei, der schaukelt gern und schreit dabei. Der Marabu, der Marabu, der hebt ein Bein und schläft dazu. Dem Vogel Strauß, dem Vogel Strauß, dem fallen schon die Federn aus. I like this. Is it your translation, Grumb? But I also like Das Krokodil, das Krokodil, das ist sehr faul und tut nicht viel. I forgot to mention the floppy-eared, Indian goats, like the Jordanian ones Nij once showed. An extinct goat from the island of Majorca lived like a cold-blooded crocodile. That’s a bit of a shocker, Dearie. But it ties everything together beautifully. Thanks. Yep, my translation. I thought “large and grey and long in front” was the best. Isn’t it amazing how such things can just clatter onto your plate, like a wish fulfilled in a Grimm fairy tale? They just come out of nowhere. Actually not out of nowhere, now that I think about it. To do the English, I put myself in a frame of mind: I’m reading to a child, thinking about how the child might see things in a way that seems odd to an adult, but also trying to find expressions that might make the child laugh. Going 50/50 with the child on straightforwardness and silliness, I suppose you could say. Dearie, this finding of yours is wonderful!! When my daughter was younger I tried writing for children, but I wasn’t able to hold her friends’ interest; I would head off in some arcane direction that I thought they ought to find interesting, like votes for women. You, on the other hand, obviously could; perhaps you should pursue it. After a day spent by travelling through Vienna to Mallorca, just now I read your honoring presentation that make me feel megkoronázott indeed, and I cannot find the proper words to answer… besides thank you. Also in the name of Julia, of Kata, of my Hebraist brother Gyuri from Copenhagen also publishing here sometimes as “A Két Sheng Szerelmese”, and of course of Wang Wei from Mallorca who, even if he does not often write in the Poemas del Río Wang, is co-founding father of it, and from whose studiolum I’m enjoying the marvellous view as I’m writing this. Thanks to Dearie for the crocodile-goat of Mallorca. This is a perfect link indeed between blogs and places and times. And the translation of Grumbly! I loved it much more than the German original. The rattlesnake, the rattlesnake, be grateful for the sound he makes. I especially like the last line of the German — mit Dativ yet! How unusual is the expression Vogel Strauss? I mean, it’s a usual way of naming the big bird in German, as I learned when looking into the ostrich/strut question some months ago; but it seems so unGerman to stick two nouns together like that without making one word of them. I’m hoping that if I ask this question right I can trigger a good soaring rant from Stu about “parts of speech”, or even about “words”. I get nearly the same number of hits for Vogelstrauss as I do for Vogel Strauss, so some people agree with you, Ø. For anyone who thinks the Wholly-Roman Empire is a straightforward DIN culture, die Strauss(en)wirtschaft is a place in Austria that sells home-grown (sic) wine when a broom is displayed outside. Studiolum, the man: Thank you. How unusual is the expression Vogel Strauss? I see now that I had been conflating 1) and 2) in order to understand der Vogel Strauß. 2) is actually the name of the ostrich (species), which I hadn’t known. It comes from the Greek strouthos (mégas)= (big) bird. I assume that in the expression der Vogel Strauß, the Vogel bit is added for clarity, since ein Strauß is also a bouquet. Like saying “the bird kite” or “the feathered kite”. instead of just “the kite”. Among ornithologists, I bet “kite” alone would suffice. Nowadays, you are in fact more likely to hear Straußvogel instead of Vogel Strauß, which sounds a bit high-tone to me. Petersen erhob sich, frisch, munter und zuversichtlich, in tapferer Attitüde, streitbar und bereit, den Strauß zu wagen (Buddenbrooks). Petersen arose refreshed, in good spirits and confident, head held consciously high, prepared to risk the confrontation. Or “eager to try his mettle”. So are Richard and Johann Strauss so named because of the bouquet, the ostrich or the skirmish? I think only Richard Strauss (not “ß”) stuck his head in the sand, during the Nazi years. There were two Richards, father and son. Did you know that? I didn’t. No, I only knew of two Johanns. Too bad. You had me all excited for about a minute and a half. Did you know that the Emu is so-called because it tries to emulate the Strauß? It looks like a struts* with a thatched roof. I’m calling it the New Holland Cassowary from now on. When I looked up emu in the WiPe, I found the strange word “ratite”: “It is also the second-largest extant bird in the world by height, after its ratite relative, the ostrich.”. A ratite is any of a diverse group of large, flightless birds of Gondwanan origin, most of them now extinct. Unlike other flightless birds, the ratites have no keel on their sternum – hence their name, which comes from the Latin (ratis) for raft. Without this to anchor their wing muscles, they could not fly even if they were to develop suitable wings. Don’t you think the expression “of Gondwanan origin” is a cop-out? They might as well have written “of terrestrial origin”. P’raps it carries the implication of when those dicky birds became distinct? Yeah, but Godwana’s “final suturing” was 500,000,000 years ago, see the link! I can imagine the geological evidence for that, but where is any ornithological evidence that old for birds? To put my point another way, “of Godwanan origin” seems to be introducing preciseness, but I bet it has no more substance than “long, long ago”. The Norway goats, the Norway goats, they live on berries, grass, and oats. Is as non-trivial as can be. Brněnský drak, brněnský drak, er hengt i et museumstak. Oh, man O’Hare, who brought it there, be glad that’s all you had to bear! and, better still, its blood was chill: the Balearic caprodil. The ostrich brand, the ostrich brand, was launched throughout Gondwanaland. A worldwide thirst, then market burst, when emu later was dispersed. Thanks to all. This was fun. Caprodil !! Now I want some. I bet they look best in a small vase. Once upon a time in Gondwanaland. In Denmark I saw many buildings with a ship hanging from the ceiling. The hippo now, the hippo now, it’s wet and wider than a cow. When ostriches appeared here some months ago, I learned the bird word Strauss, but somehow got the wrong idea that (unlike the bouquet word Strauss) it was feminine. If it did happen to be, would one say der Vogel Strauss or die Vogel Strauss? That didn’t fit into the meter. Anyway, I’m beginning to suspect that this is a “merely-by-empty’s-definitional-convention” matter. Coz’ I haven’t been able to figure out what you mean. Maybe it’s just that I haven’t really understood in detail how the reduction works and what it is good for. The expression der Vogel Strauß is very unusual, as I said. It does not accord with the usual patterns of talking about animal species and individuals of those species. So I can only give you my own touchy-feely explanation of how one would deal with your thought experiment about *die Strauß. In the expression der Vogel Strauß, the Vogel bit specifies that we are talking about an animal species/family. This is done, as I have been assuming, because Strauß is ambiguous. Strauß meaning bouquet is a very common German word, because bouquets are often bought and given as gifts. The animal/species/family Strauß hardly existed in Germany until a few years ago, and at any rate is not native there – so you rarely heard the word. My feeling is that der Vogel Strauß should work semantically and syntactically just like der Straußvogel. Demzufolge no matter what the gender of the ostrich-word Strauß, it is merely in apposition to the main noun der Vogel in der Vogel Strauß. (Think of the old-timey “the man Adam” in English). The ostrich-word Strauß would not be declined, no more than it is in der Straußvogel. The gender of the word Strauß would not appear in either combination. The der in der Vogel Strauß is the der of der Vogel, not of der Strauß. So even if it were *die Strauß, it would still be der Vogel Strauß. I’ve written so much about this infrequently occurring expression because the details of what I have written are intended to give you a better feel for the general situation. The exceptional expression is just a pretext to exemplify the standard ones. I forgot to mention the accusative. There might be a House of Crows in an amusement park, like a House of Horrors. There you get on a little train and travel into the maw of a gigantic crow. This would be described as in die Krähe hineinfahren. Similarly, travelling into the House of Evil Ostriches would be in den bösen Vogel Strauß hineinfahren. Its private views are often foul. The der in der Vogel Strauß is the der of der Vogel, not of der Strauß. That’s what I was guessing. Thanks for the detailed response (which I did not notice until today). You deserve a Strauss Blumen for your efforts.